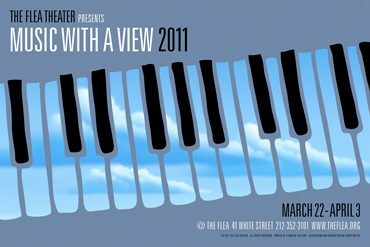 The Flea is pleased to announce Music with a View 2011, a festival running March 22-April 3, 2011. For the first time, all concerts will take place in a festival format, with special activities such as lectures, workshops & and forums adding to the excitement. This will be a chance for artists and audience members to brainstorm over a range of topics including where music is going, where New York is heading, what you’d like to see in events, what artists would like from the audience, and a host of other things. Guest speakers and panelists to be announced. This event is envisioned to be part salon (from 19th Century artist circles) and part open mic nights of today, with spoken word and karaoke. This event was inspired both by the abundance of great applicants this year, many more than we could present, and also from observing so many talented and creative amateurs and what they’re able to play and write. Music With A View is a music festival devoted to the discovery of new, fresh sound created and performed by contemporary musicians. Each event features the works of 2-3 emerging and/or mid-career composers and is followed by an open discussion between the artists and the audience.